Fiji’s beautiful Islands are situated between 15 and 20 degrees south of the equator and straddles the 180th meridian of longitude, or the International Dateline, and so becomes the gateway of a new day. The total land area of Fiji is 18,333 square kilometers. The largest island, Viti Levu is 10,429 square kilometers and the second largest, Vanua Levu is 5,556. Fiji is made up of 333 islands, predominantly volcanic with smaller coral or limestone islets. They are spread over thousands of square kilometers of ocean in the heart of the South Pacific. Around one third of these islands are inhabited. Situated in the hub of the Southwest Pacific, Fiji has become a major crossroad for shipping services between North America, Australia, New Zealand and between the regional South Pacific countries. Vessels enter the country via the natural harbours at Suva and Lautoka. Fiji Ports Corporation Limited (FPCL) commenced operations on 01 July 2005 after two reforms in the Port industry. More commonly referred to as Ports Authority (PAF) Fiji Ports Corporation Limited was registered as a company on 18 August 2004 and operates under the Seaports Management Act 2005. 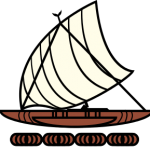 PAF was created 01 November 1975 as a statutory body under an act of Parliament of the Ports Authority of Fiji Act (No 20). In the ensuing years, it became evident that there still existed anomalies that were detrimental to the efficient and successful managing of Fiji’s Ports to attain the desired results. FPCL was borne out of this second reform under the Public Enterprise Act. Prior to establishment of the PAF, ports operation was run jointly by a number of Government Departments,the stevedoring and cargo handling controlled by overseas shipping companies with its agents in Fiji. The establishment of PAF under an Act of Parliament in 1975 following recommendations by the Ports Commission of Inquiry which studied operations and administrations of ports in Fiji. The setting up of the Authority saw the integration of all port operations into a single autonomous BODY. The statuary functions of the Authority as set out in PAF Act no 20 of 1975. To provide and maintain adequate and efficient services and facilities in ports and their approaches. To regulate and control navigation within ports and approaches. To promote and use ,development and improvements of ports. To acquire land and execute such works as necessary for the functions of the Authority under provisions of the Act or according to other laws of the country. The PAF achieved profits from 1975 until 1992-1994 when it recorded losses. In 1996 the PAF had commissioned a review of its business operations in anticipation of the Public Enterprise Act and the corporatisation of the PAF. With the passage of the PE Act by parliament in December 1996 ,PAF was nominated a re-organised enterprise in April 1997. Appointment of a charter committee by Minister Of PE to prepare a reorganisation Charter which will set the direction of corporatisation process which was adopted in October 1997. It involves the split of PAF into a Governmental Commercially Company called the Ports Terminal Limited (PTL). PTL assumed the commercial responsibilities of PAF involving cargo handling . The two entities PTL and MPAF commenced operations on 1 st March 1998 from which date Ports Authority Of Fiji cease to exist. This was based on specific commitments in the 1997 re-organisation Charter for the PAF to undertake further reforms in the Port sector. The objectives was to establish a government owned port company (FPCL) with a clear focus on ownership and management of port assets. Also increase the operational efficiency of the port company through an intensified focus on commercial activities and by consolidating the governments assets within port sector in a single government entity. Landlord and property development functions of the port. Management of port infrastructure and superstructure. Port services provider and also enable competition. Ensure maintenance , safety and environmental standards within the port estates. Transfer specific functions associated with the performance these roles from MPAF and PTL to FPCL ,together with assets required to undertake these functions. Transfer of pilotage responsibilities from PTL to FPCL. Transfer of regulatory functions of MPAF to FIMSA . The incorporation of FIJI PORTS CORPORATION LIMITED (FPCL) under the companies Act and declared a Government Commercial Company under the Public Enterprise Act. Regulatory functions (portstate, tower control) were moved to FIMSA. On 1st July 2005 MPAF ceased to exist and Fiji Ports Corporation Limited took over wharf assets and business with Ports Terminal Limited as subsidiary to FPCL handling cargo operations. On the 5th November 2015, the Fijian Government divested 59% of the shares in Fiji Ports Corporation Limited (FPCL) at a value of more than FJ$100 million. 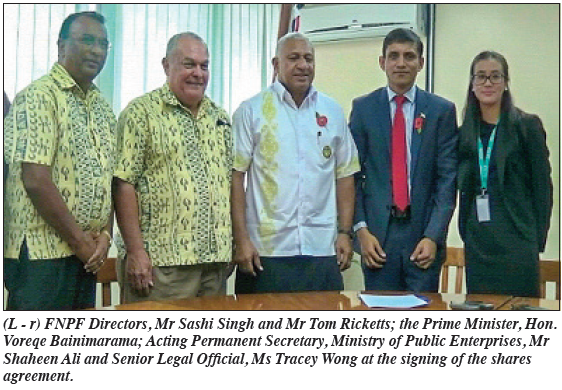 The legal agreements were signed by the Prime Minister of Fiji, Honorable Josaia Voreqe Bainimarama, and the consortium comprising representatives of FNPF and Sri Lankan company Aitken Spence PLC, for the partial divestiture. The Hon. Prime Minister said that the transaction is a great step forward in the Government’s asset sale divestment. Government will maintain 41% of the shares in FPCL, while FNPF will own 39% and Aitken Spence PLC 20%. 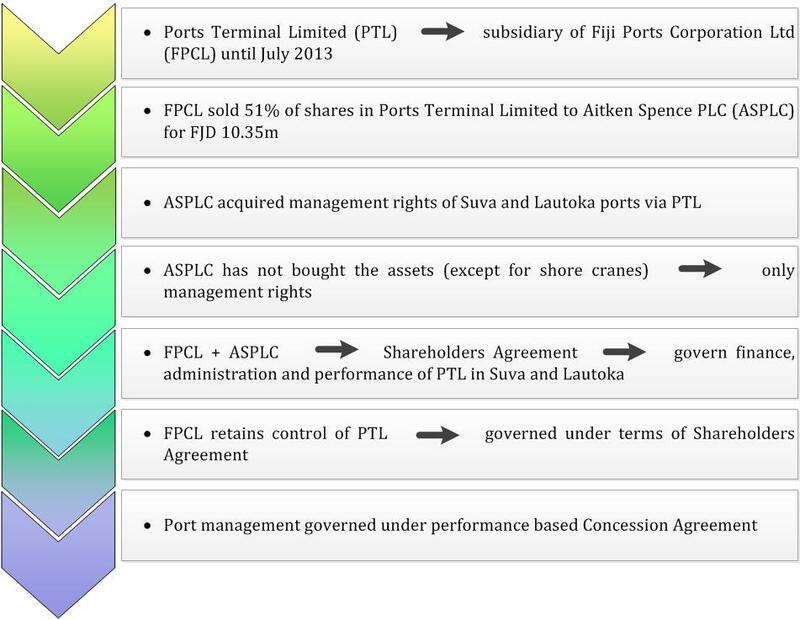 Following the divestment, 80% of the shares in FPCL will remain Fijian owned. 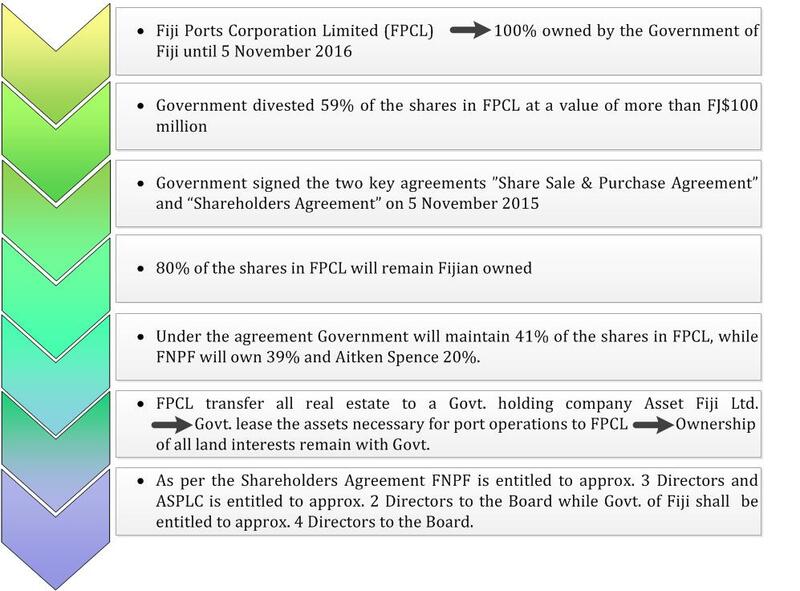 Under the agreements, Government will receive more than FJ$100 million for 59% of the shares in FPCL. The consortium of FNPF and Aitken Spence will pay FJ$99,112,330, and the Government will also receive approximately FJ$3.3 million from the sale of land to Fiji Roads Authority for the realignment of the road and bridge at Stinson Parade, Suva. Minister for Public Enterprises Hon. Aiyaz Sayed-Khaiyum said the Government’s objective for the divestiture is to secure the partnership of a long term investor in FPCL that would contribute to the development and growth of FPCL’s asset base and continue the improvement of Fiji’s sea ports, including their expansion, modernization and development of specialized facilities. “This divestiture promises to make FPCL more profitable and efficient, and will ensure that international best practices, processes and systems will be introduced that will position Fiji’s ports as regional and international hubs,” Minister Sayed- Khaiyum said. The Minister described Aitken Spence as a credible investor with a stellar international reputation. Not only does the organization have experience in port management, they also have a proven track record in Fiji where they have already helped improve the performance of Fiji Ports Terminal Limited. FPCL will transfer all real estate to a government holding company, which in turn will lease the assets necessary for port operations back to FPCL. Ownership of all land interests will remain with the Fijian Government. Aitken Spence has been recognized for three consecutive years by Forbes as one of the most successful publicly-traded companies with annual sales under US$1 billion outside of the United States. It has been a partner in Fiji Ports Terminal Limited since August 2013. In that time, it has increased productivity by 60%, improved vessel turnaround time by 33% and increased net profit by 49.5%, amounting to an increase in net profits to FJ$2,773,235, in its first year of operations. FNPF is Fiji’s largest financial institution, with total assets valued at FJ$4.9 billion.